Witness report: I took pictures of what seems to be a military air plane on September 23, 2016 just 2 seconds apart and on one picture there seems to be an oblong object just behind the exhaust trail. 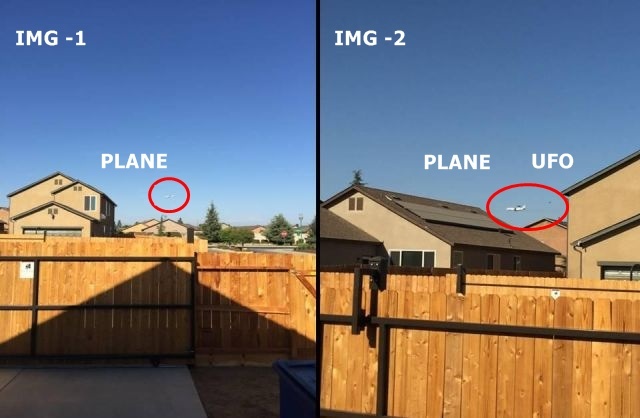 I noticed another identical airplane minutes before I took the photos because I was just curious to see what the 2nd airplane was doing, so I took several photos with my cellular phone just 2 seconds apart as the 2nd airplane was descending to FYI (Fresno Yosemite International Airport) and on one picture there seems to be an oblong object just behind the exhaust trail. It seems the object just appeared suddenly. I really can't explain it. You would need to see for yourselves. Mufon case 79763. It's quite possible that a lot of what people consider a UFO sighting is actually a man-made drone or a RC plane, radio-controlled small aircraft that is controlled remotely by an operator on the ground or in a plane. 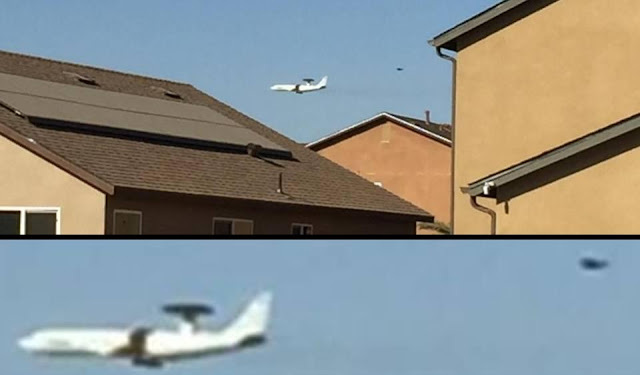 With the increase of man-made drones it is possible that the witness took a photo of a military aircraft which was testing a new drone instead of a real UFO?